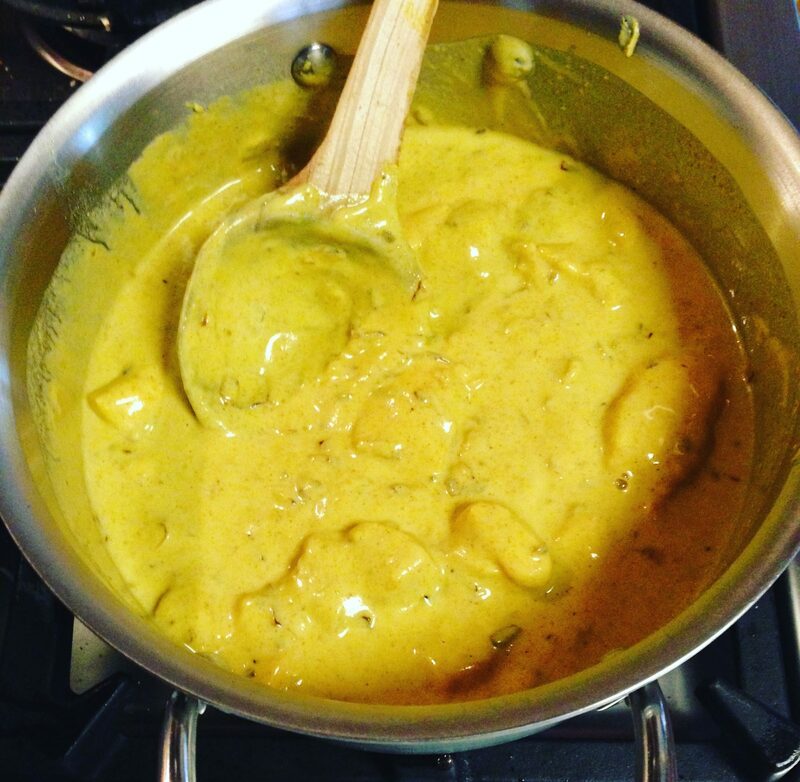 Yellow Curry Chicken is probably the foundation of Indian cooking. The Armenian lineage in my family spans at least five generations, yet somehow a curry recipe has made its way into my family. My grandfather liked to tease my grandmother all the time, especially about her cooking. She took great pride and care in making classic dishes. She would bring a big pot of old fashioned stew to the table and he would pipe up, “You know, Vilik, the neighbor’s wife adds these nice, plump chickpeas to her stew.” My grandmother would just dismiss it, saying the neighbor’s wife’s had no flavor. When I crave curry, I go home to Mom. Her yellow curry is exactly what I want. Mild, aromatic with a subtle tang from the yogurt and sweetness from caramelized onions, it is an unusual recipe in that the sauce incorporates an egg. It comes together quickly, making it ideal for busy weeknights. There is no long list of exotic ingredients. It’s so elegantly simple and delicious, you can make it tonight. No one really knows where my grandmother Vilik got t he recipe. None of my research has turned up anything remotely similar. In the recipes that I have read, the egg is an unusual addition and the technique of adding the salt at the very end is often left unsaid. Mom’s yellow curry is a family treasure that I plan on passing on to my little Daisy. Once you taste it, you’ll find yourself craving more. It’s even better the next day when the ingredients have had time to soak up each other’s flavors nicely. Leftovers freeze beautifully. On my drive in to the office today, I had a bowl of leftover curry sitting in the passenger seat next to me. I hadn’t had my coffee yet, nor anything to eat. It was 7:30 in the morning and all I could think about was getting to the office just to have a taste. Last night, I made some more fluffy white rice and added some roasted noodles (reshteh) to it just to make my lunch fancy. Sadly, my grandparents are long gone and the tradition of family night on Sundays is sporadic now. When we do gather, this luscious yellow curry keeps the happy memories alive and today, it made my cubicle feel like home, at least for a bit while, as Daisy says. Thank you! I love indian food , I will make it fir tomorrow night ? The egg is cooked into the sauce by stirring constantly to achieve a creamy texture. Made this tonight, is wonderful – thank you for posting! I added a handful of sliced almonds as well. Dear Colette, unfortunately I do not seem to have too many recipes at all from my grand-mother, which is a pity, really. Such a nice post written with such love throughtout and a wonderful family-style recipe too boot. Love all about this – keep those posts coming, dear friend.